Fiji will remove Great Britain’s Union Flag from its own national banner, Prime Minister Voreqe Bainimarama has announced. The current Fiji standard is light blue and features the Union Flag in its top left. It also includes a shield with the cross of St George, the patron saint of England, and a lion. It also features a sugar cane, bananas, a palm tree and a dove of peace. “We need to replace the symbols on our existing flag that are out of date and no longer relevant, including some anchored to our colonial past,” Bainimarama said. The Commonwealth Pacific nation gained independence from Britain in 1970. 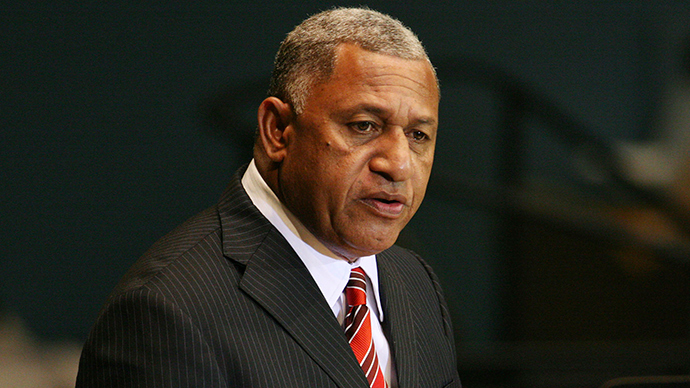 Bainimarama said a national competition would be held to agree on a design. A new flag should be ready for Fiji’s 45th anniversary of independence on October 10. Bainimarama removed the Queen’s head from Fiji’s currency when he ruled the country by military decree. Britain’s Union Flag design features the Scottish Cross of Saint Andrew counterchanged with the Northern Irish Cross of Saint Patrick, covered with the English Cross of Saint George, representing the union which makes up the United Kingdom. Three other former British colonies maintain the Union Flag on their banner. These include Australia, New Zealand and the Polynesian nation Tuvalu. “Our flag is the most important symbol of our national identity and I believe that this is the right time for New Zealanders to consider changing the design to one that better reflects our status as a modern, independent nation,” Key said last October when announcing the referendum. Australia's Foreign Minister Julie Bishop said there was “no great demand” to change the national flag. Tuvalu has yet to announce plans to remove the Union Flag.